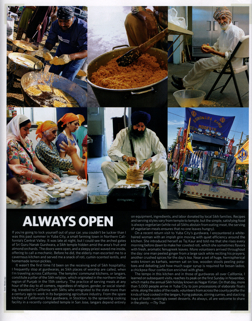 I have a short piece in the current issue of Saveur Magazine (November 2007) about the Sikh tradition of langar, or communal kitchens, and about the annual Sikh parade in Yuba City, CA. Several of my photos ended up appearing in a colorful montage. A couple of photos from my visit to the Stockton Gurdwara were mixed in with those from my visit to the Yuba City temple.